Gaming on the iPhone just got an upgrade. With Thursday's release of the iPhone 4 following on the heels of Monday's iOS 4 update, the iPhone just became more graphically impressive, more socially connected, and a more powerful device in the challenging game market. Not only does the iPhone 4 look to be the most impressive smartphone Apple has ever created, but the iOS 4 signaled a continued interest by Apple in the success of its App Store gaming market. By providing tools that will allow developers to make games more graphically impressive and more fun to play in its mobile OS, Apple has once again given iPhone gamers and developers alike reason to celebrate. Traditionally, big console companies like Nintendo and Sony have pushed the gaming market forward by developing graphically impressive and innovative technologies. But in the mobile market, it’s Apple that is innovating. While the Sony PSP and Nintendo DS are graphically comparable to the iPhone 3GS, the release of anti-aliasing-capable iOS 4 means Apple has a temporary graphical leg-up on the competition. Nintendo recently announced that its new 3DS will ship with a Digital Media Professionals PICA200 chip that will be capable of full-screen anti-aliasing, but since the platform still has no release date, right now Apple’s iPhone platform has an edge. Thanks to iOS 4, for the first time ever, iPhone game developers will be able to use anti-aliasing when designing their games. Visually, anti-aliasing capability is a huge leap forward for the device, making for less jagged edges found in curved, diagonal, and shaped lines and clearer, less pixilated objects. The iPhone’s graphics processor will ensure that the color selected for pixels bordering the edges of 3D objects (like cars, characters, and weapons) will blend better with their surroundings and appear clearer. The result is 3-D objects that look much more realistic. “From a developer standpoint, we are excited about the new features iOS4 offers as it will allow our games to be better viewed and played,” Jon Kromrey, general manager of Apple games at Namco Networks, said. 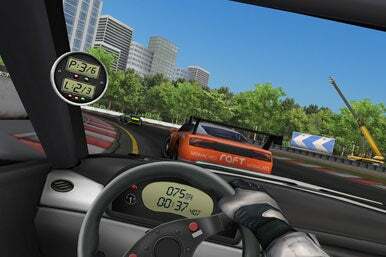 The latest version of Real Racing for the iPhone takes advantage of iOS 4’s anti-aliasing features. Several gaming companies have already released updates to their games with anti-aliasing. Firemint, behind such popular titles as Real Racing and Flight Control, has already released updates to its games to take advantage of the new capabilities. "We were very happy to see that iOS 4 enables anti-aliasing, and we have already released free updates for Flight Control and Real Racing that implement this for smoother edges in the graphics. The updates also support multi-tasking so you can easily switch between our games and other apps,” said Alex Peters, Firemint’s community manager. Not only will Game Center make great games easier to find, but there will be new social features for gamers to utilize such as notifications, streaming video, leader boards, and stats. “It will be very cool to interact with other gamers in different ways, from direct challenges to recommendations for friends, to comparing your stats for certain in-game challenges,” Adair said. The newly released iPhone 4 further ups the gaming ante with its visual enhancements—specifically the 960-by-640-pixel Retina display at the heart of the phone's new form factor. Thanks to its Retina display, the iPhone 4 boasts four times as many pixels as the previous generation iPhone. “With the 960-by-640 Retina Display, we can take the iPad assets and create better views for the iPhone 4 players,” said Namco's Kromrey. More pixels also means developers can create larger scaled games. To Chris Plummer of game-maker Ngmoco, the new iPhone's Retina display will let users appreciate vast landscapes and truly epic views for the first time. “The power of the Retina display is obvious when you zoom out from your planet in GodFinger and see your entire world and all of your followers still going about their lives while you gaze down from deep space with neighboring planets in view." The iPhone 4’s three-axis gyroscope is also creating some buzz with game developers. In addition to the iPhone’s accelerometer, the gyroscope should create better motion sensing and open up new possibilities in terms of gameplay. Instead of turning the iPhone like a steering wheel, the iPhone could presumably be used like a paintbrush or conductor’s wand. The gyroscope may also open up new possibilities in the first-person shooter genre. Eliminate Gun Range, an upcoming combat game from Ngmoco, was developed with the gyroscope/accelerometer setup in mind. “The gyroscope opens up all kinds of new control possibilities. When we started developing Eliminate Gun Range, I was amazed at how accurate the g-scope controls were. It’s amazingly precise and intuitive,” Plummer said. Kromrey of Namco also sees the potential of the gyroscope to create new possibilities in gameplay as well as nimbly handling formerly challenging tasks. A game like Namco Network’s I Love Katamari, inspired by the Playstation’s 2 quirky Katamari Damarcy, could benefit greatly from the iPhone 4's gyroscope, creating a control setup with a “much more immersive feel,” Kromrey said. The mobile gaming market is changing and with it, so is Apple. iOS 4's release may be the most gamer-friendly update for the iPhone yet, providing developers with important tools to make games both visually and socially appealing. And with the iPhone 4, Apple has also ensured it will have a mobile platform capable of competing with the best of what Nintendo and Sony have to offer. Games should only get better from here, but questions remain. Will developers continue to develop for the older versions of the iPhone as the gap between the newer iPhones and older iPhones becomes wider? Will developers that build their own social networking systems be able to incorporate Apple’s Game Center? And finally, what new genres and game styles with the gyroscope create? Whatever the answers, it’s an exciting time to be a Mac gamer.